Just at the right time where a country is moving to the digital economy, Samsung India has launched its flagship mobile payments service, Samsung Pay in India. 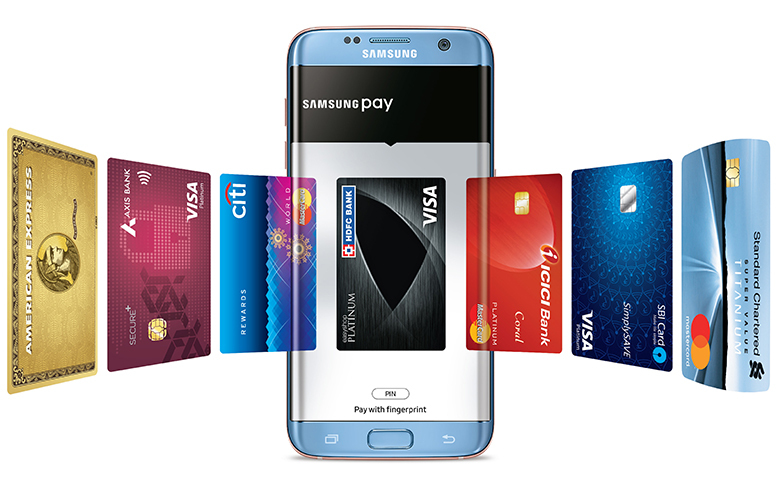 Samsung has partnered with Visa, MasterCard, American Express, Axis, HDFC, ICICI, SBI and Standard Chartered Bank. Samsung Pay first stored your Card details in its secured system and it uses either NFC or MST (Magnetic Secure Transmission) to pay the bill. As of now, Mobile Payment is a most secure method to do any transaction as you’re not sharing original card number. It uses Digital random token at the time of transactions. In India, most of Point of Sales terminals uses MST (Magnetic Secure Transmission) and Samsung Pay replicates a card swipe by wirelessly transmitting magnetic waves, which means you can pay the bill with Samsung Pay near your stores. To pay the bills, You just have to use the Eligible Samsung phones near the POS machine, select the card and pay it using fingerprint or PIN. Samsung Pay also compatible with the PayTM and UPI services. With Paytm, the user can pay by scanning QR codes, generating one-time codes for merchant payments and also do peer to peer money transfers.